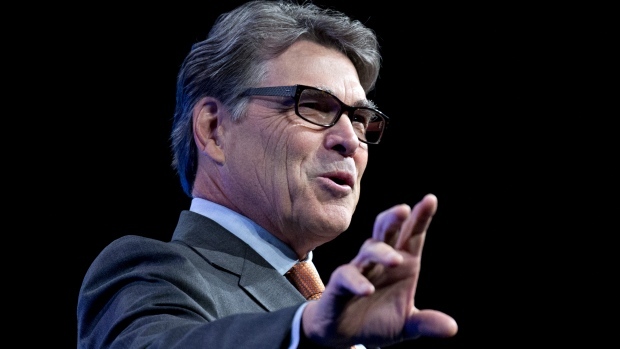 (Bloomberg) -- Energy Secretary Rick Perry’s days of flying under the radar are over. Thanks to the Democratic takeover of the House, Perry can expect to spend more time in the congressional hot seat, defending the Trump administration’s controversial efforts to shore up coal-fired power plants and its chumminess with a coal baron eager for that intervention. Perry’s not the only one. Democrats also plan to grill the leaders of the Environmental Protection Agency and Interior Department as they investigate the Trump administration’s work to accelerate energy development and weaken environmental safeguards. When the new Congress convenes in January, Democrats will be in charge of House committees -- able to set their agendas, dictate their investigations and use their subpoena power to compel documents and haul reluctant witnesses before the panels. And they are already vowing vigorous oversight on energy and environment -- a marked contrast from the past two years, when Republicans were reluctant to aggressively question the Trump administration’s handling of those issues. In Democratic hands, those House committees are set to probe the government’s approach to science under Trump, conflicts of interest within the administration, and the process agencies have employed to reverse Obama-era policies, said Democratic aides who asked not to be named discussing strategy. Environmental advocates are pressuring House Democrats to get tough -- and are setting a high bar for results. “With a wave of climate champions taking charge in the House, the next two years will bring an unprecedented wave of accountability and pressure that will make the last two years look like a walk in the park for Trump and his corrupt accomplices throughout his White House and cabinet,” said Michael Brune, executive director of the Sierra Club. Perry is just one target, after largely escaping the controversies and ethical pitfalls that have engulfed counterparts at the Environmental Protection Agency and Interior Department. Across Capitol Hill, congressional Democrats are making plans to use their newfound majority to probe how Perry and other Trump administration officials have allowed outside interests to shape federal policy. A key focus will be the Trump administration’s plans to stave off closures of uneconomical coal and nuclear power plants and the extent to which billionaire coal magnate Robert E. Murray has influenced policy. Murray, the founder and chairman of mining company Murray Energy Corp., has aggressively pushed Trump administration officials to support coal power plants operated by one of his biggest customers, FirstEnergy Solutions. The House Energy and Commerce Committee is set to scrutinize the entire effort, allowing everyone to “more fully understand what’s been driving these very radical administration initiatives on reshaping energy markets,” said Tyson Slocum, director of Public Citizen’s energy program. Expect the House Natural Resources Committee to examine what prompted National Park Service officials to delete references to humans’ role in driving climate change from a scientific report on rising seas. The Energy and Commerce Committee could scrutinize the Environmental Protection Agency’s shakeup of its science offices and advisory committees. The EPA’s moves to undo a raft of air pollution rules imposed under the Obama administration also will get attention. So will the environmental consequences of Trump’s planned border wall and the administration’s decision to slash protections meant to help foster habitat for the vulnerable greater sage grouse. Other areas ripe for scrutiny include the Energy Department’s slow moves to deploy funding for renewable energy research and implement efficiency standards finalized by the previous administration, Carr said. Already, congressional Democrats have demanded communications between Energy Department employees and representatives of companies that benefit if those energy savings mandates are stalled or undone. Texas Democrat Eddie Bernice Johnson said she would use her expected chairmanship of the House Committee on Science, Space and Technology to “restore the credibility” of the panel, which for the past six years has been used as a platform by Texas Republican Lamar Smith to cast doubt on mainstream climate science. And under Arizona Democrat Raul Grijalva, the Natural Resources Committee is set to investigate whether -- and how -- the Interior Department accounted for public comments when it recommended shrinking the Bears Ears National Monument in Utah, and what went into a decision to remove a barrier to copper-nickel mining near 1 million acres of wilderness and lakes in Minnesota. One of the committee’s top priorities will be probing actions by Ryan Zinke, including the Interior chief’s “ethical challenges” and his efforts to reorganize the department, Grijalva said in an interview. “We are going to be taking our oversight responsibility very very seriously,” Grijalva said. Democrats also are facing pressure to up their game on environment and climate issues -- and use their House control to advance specific plans for countering global warming -- in the wake of a dire United Nations report warning that imminent action is needed to prevent a cascade of catastrophic consequences. Democratic Leader Nancy Pelosi of California is already laying plans to resurrect a special committee focused on climate change, a move that will give House Democrats a platform to spotlight an issue on which polls show President Donald Trump is out of step with the public.